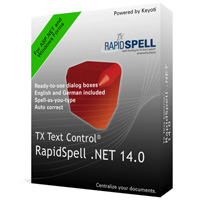 Today, we released the first service pack for TX Text Control RapidSpell .NET for Windows Forms 14.0. Please uninstall the previous version and install this new setup. Customers who are using the trial version should download and install the latest trial version.